Add a Ladies Offroad Network badge to your website, and make connecting with us as simple as clicking a button. We offer the official graphics below for you to use on your website or blog. Choose the badge option you like, highlight and copy its corresponding code snippet, and paste it into your webpage's HTML code. You can adjust the size of the badge by changing the width. 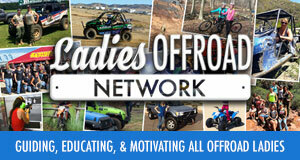 Thank you for supporting Ladies Offroad Network!